This is a revised form of a paper originally read to the New Testament seminar at King's College London in February 1977. I am grateful to Professor C. F. Evans for his courtesy in inviting an ⋯λλογεν⋯ς from another discipline to participate in his seminar, and to those who contributed to the discussion. London 1977. It has not been my intention here to engage in the wider debate that this book has engendered, or even to criticize Goulder's thesis in detail. Some of the difficulties in that thesis are already shown by another article in the same volume, F. Young, ‘Two Roots or a Tangled Mass?’. Isser, S. J., The Dositheans SJLA 17 (1976), pp. 74 f., sets out some of the difficulties in establishing the sources of Abul Fath's traditions. Deut. 5. 25 f.; 18. 18–22; 5. 27 f.
 E.g. Scobie, art. cit., p. 393 and note 4. ‘The Samaritan Pentateuch and the New Testament’, N.T.S. 22 (1976), 441–3. Apparently a similar type of argument was used by Mare, W. H., ‘Acts 7: Jewish or Samaritan in Character?’, W.T.J. 34 (1971), 1–21 (not accessible to me). He rejects the view that a consistent pattern of Old Testament quotations can be found in Acts 7 which favour the Samaritan Pentateuch/LXX tradition rather than that underlying the MT. So Haenchen, E., The Acts of the Apostles (Oxford, 1971), p. 280: ‘the text is quoted from memory’. So Owen, H. P., ‘Stephen's Vision in Acts VII 55–6’, N.T.S. 1 (1954/1955), 224–6. So Scharlemann, M. H., Stephen, a Singular Saint, Analecta Biblica 34 (Rome, 1968), pp. 15 f. Goulder, art. cit., pp. 72 f., draws attention to this usage with regard to Simon Magus, but does not link it with this usage in Acts 7. Isser, op. cit., p. 140. In Theological Dictionary of the New Testament, VIII, p. 463. Isser, op. cit., p. 142, notes the existence of anti-temple feelings among some Samaritan groups, but such a negative point can scarcely of itself provide evidence of Samaritan thought here. Samaritan Chronicle II (BZAW 107, 1969), 1 Sam. Sect. M, F* (=p. 132). Sam. Chron. II, 1 Kings I–XI, Sects. G & I (Macdonald, pp. 149–52). Art. cit., p. 291. For the unsatisfactory nature of such a view, cf. 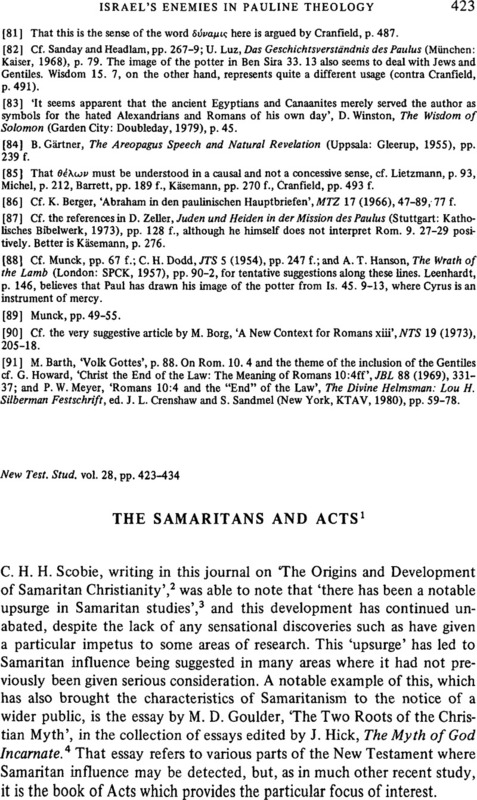 Coggins, , Samaritans and Jews (Oxford, 1975), pp. 13–19. The quotation is Scobie's summary (art. cit. p. 392) of Scharlemann's views (op. cit., p. 52–56). As well as Munck, one might cite Neil, W. (New Century Bible, 1973). Op. cit., p. 42 and note 7. The point is well made by Aune, D. E., ‘Orthodoxy in 1st century Judaism?’, JSJ VII 1 (1976), 1–10, though without specific reference to Stephen. Isser, op. cit., p. 141, draws attention to other parallels with Peter's speech. Kippenberg, , Garizim und Synagoge, RGVV 30 (1971), esp. pp. 122–8. Op. cit., pp. 125 f.
 It is clearly impossible in a short article of this kind to explore this still largely uncharted territory. Though it has been rendered out-of-date in some respects by more recent work, the best general survey is probably still Daniélou, J., The Theology of Jewish Christianity (London, 1964). See Hull, J. M., Hellenistic Magic and the Synoptic Tradition, SBT II, 28 (1974), esp. ch. 6. Haenchen, op. cit., p. 303; Kippenberg, op. cit., p. 330. Jervell, , Luke and the People of God (Minneapolis, 1972), p. 117. The text has frequently been quoted; e.g. by Robinson, J. A., St. Paul's Epistle to the Ephesians (London, 1903), p. 160. Josephus, , Antiquities, 9, 291.